General William W. Crouch graduated from Army and Navy Academy in 1959 as the Battalion Commander, channeling his initial leadership position into a distinguished career in the military that spanned 36 years, commanding soldiers at every level from platoon through army. His military career culminated as the United States Army’s 27th Vice Chief of Staff before his retirement in 1998 as a four-star general. 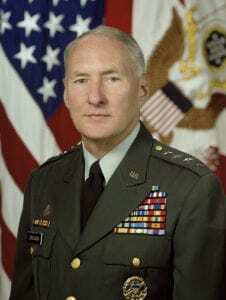 His awards include the Defense Distinguished Service Medal, the Silver Star, the Legion of Merit, and the Bronze Star. After retiring from the Army, he served as one of five generals who oversaw the Army’s Battle Command Training Program, training major Army organizations for both wartime and peacekeeping missions. General Crouch graduated from Claremont Men’s College with a degree in Civil Government, and holds a master’s degree in History from Texas Christian University. He was a Senior Fellow with the National Post Graduate School in Monterey and served on the Board of the Community Anti-Drug Coalitions of America. After serving as Vice Chairman on the Army and Navy Academy’s Board of Trustees, he continues to serve as an Emeritus Board Member, as well as on the Board of the Keck Institute for International and Strategic Studies at Claremont McKenna College. In 2016, he was the inaugural speaker at Army and Navy Academy for the Warrior Wisdom Speaker Series, presenting “Leadership in Adversity” to over 300 guests. In 2017, he was the alumnus recipient of the Distinguished Warrior Award for his unwavering commitment and service to Army and Navy Academy.